Enhance productivity with unparalleled desk phones for voice, video, and UC. Help your teams move faster with exceptional desktop phone audio quality and built-in flexibility. Our open standards approach to desk phones delivers best-of-breed results and makes collaboration effortless, and desktop solutions realistic. Get a first-class phone experience with enterprise-grade audio, video, and applications support with robust interoperability. 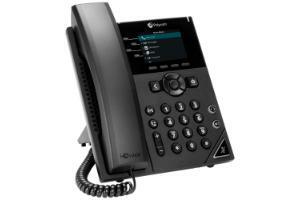 A broad selection of easy to use, high-quality desk phones and applications for organizations of all sizes. Crystal-clear conversations thanks to the best audio quality and desktop solutions in the industry. Seamless integration into a wide range of communication environments. Advanced features that streamline workflows and improve productivity. Choose the phones, applications, and services that are right for you—and be assured that your VoIP phones will always work with every system. With organizations embracing open standards and SIP, single-vendor lockup is a thing of the past. A wide array of high-definition voice and video solutions for every need. Broad interoperability with leading hosted and premises-based IP PBX (including Skype for Business) or H.323 video systems. Simple, intuitive touchscreen interface reduces training and IT support costs. Straightforward deployment, operation and maintenance with the industry’s most robust SIP software. Bluetooth integration and color display-based expansion modules. Reap the benefits of the industry’s broadest open standards-based, feature-rich software for IP-enabled devices. Streamline installation with direct integration into over 60 call control platforms. Simplify the management of Polycom devices. Slash downtime with robust security options. Reduce training and support costs with familiar user interfaces. The Polycom VVX 101 is a one-line SIP phone for a home office or shared/common areas delivering enterprise grade sound quality. The Polycom VVX 150 business IP phone is a high quality, two-line, IP phone that delivers reliable performance and an enterprise grade sound quality. It is ideal for home offices or shared/common areas or any: locations that needs simple and reliable voice connectivity. The Polycom VVX 250 business IP desk phone is a high quality, four-line, IP phone that delivers reliable performance and an enterprise grade sound quality. It is ideal for knowledge workers, cubicle workers who need the high-quality features that today’s modern business environment demands. The Polycom VVX 300 Series phones are 6-line entry-level Business Media Phones designed for today’s cubicle workers that handle a low to moderate volume of calls and need crystal clear communication. 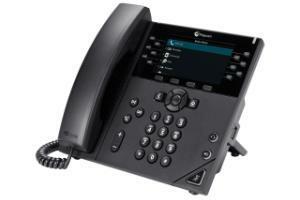 The Polycom VVX 350 business IP desk phone is a high quality, six-line, color, mid-range, IP phone designed for SMBs. It is ideal for knowledge workers, and call center operators who need to handle moderate/high volume of calls and whose work demand reliable connectivity. 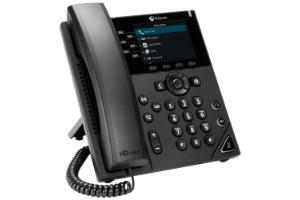 The Polycom VVX 400 Series are color 12-line mid-range Business Media Phones designed for today’s office workers and call attendants who depend on crystal clear communications. 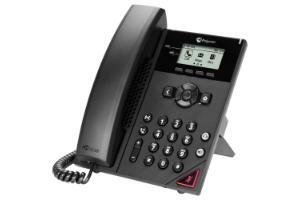 The Polycom VVX 450 business IP desk phone is a high-quality, twelve-line, color IP phone for businesses of all sizes. It is ideal for knowledge workers, executives and upper management. The Polycom VVX 500 Series business media phones are designed for today’s busy managers and knowledge workers They are powerful yet intuitive office phones that can keep up with their multitasking and schedule juggling. The Polycom VVX 1500 unites advanced IP telephony, videoconferencing and business applications into a seamless communication experience. The Polycom VVX 1500 D Business Media Phone combines advanced IP telephony, videoconferencing and business applications and offers seamless communication experience.